Hey! I’m Too Young to Be Married to a Retired Man!!! This afternoon I mentioned (in a comment) that my husband recently retired a little earlier than we had planned. The last (+/-) five years have brought on a few new “conditions” which are the impetus to his “early” retirement. I know that I have recently written about a few hospital stays he has had. These hospitalizations played a large part in our decision. I kept telling him that I thought it was time for him to “take it easy”… although, in his case, it will just be “a little easier”>>> He’s not a “take it easy” type of guy. These last two weeks (he started his retirement at the beginning of April) have been a time of adjustment for both of us. I am trying to get him to sleep in longer, but after so many years of 6:00 am wake-ups, he considers 8:30 to be late. Also, since I used to get up right after he left, I no longer have my early morning routine going by 7:00 am. I am finding that if I have errands or shopping to do, I don’t even get out the house until at least 10:30. It is really nice having him home. However, it is a little “different”>>> I’m used to coming and going whenever I want. I mean, I used to say goodbye to Sprite, but now I actually have a dialogue before I leave the house. I don’t simply pat my husband’s head in the kitchen and assure him “I’ll be back soon.” as I walk out the door. Unlike Sprite, he actually talks back! I’m glad he’s home. I just wish I could get him to sleep in longer AND take it a little easier. The changes you’re looking for will probably come in as more time goes by. It will be nice for you hoth to find new hobbies to do together too. I wish both a peaceful and fun transition. Annie S, thanks for the well-wishes. I know we will get into a “groove” eventually. Just three weeks ago my husband would DVR the Spurs basketball games so that he could watch them the next day, which meant trying to avoid hearing the score the whole next day. This, of course, meant avoiding his Google main page. He was feeling so tired all of the time that he couldn’t go to sleep after 10:00. Now he can DVR the games and watch them on delayed viewing that very same night. My husband took early retirement; and has been retired almost the whole ten years we’ve been together. It was really hard, at first, to keep working while he was at home. Part of what I realized was that he needed that time of adjustment and finding the rhythm of life (our relationship was new, too). Gail, it sounds like you and your new husband were quickly able to find a good balance. I like that expression: “rhythm of life”. Wait! There are self-propelled vacuums??? I have an upright. It is not self-propelled! How is it that he knows this??? Do not let that man in the house with his self-propelled mower by mistake!!! Ha! Congrats on the retirement. May you have many lovely days ahead that include … him cleaning!!! You go girl! And let us know how that self-propelled vacuum works out too!!! 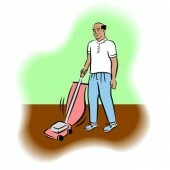 Maria, the self-propelled vacuum came, and it is so easy to glide that I told my husband he could do the dusting! My husband retired early at age 59 after telling me that most males in his family died at age 63 from high blood pressure. He is now 80 and just returned from touring China. I am glad that he has had this time to enjoy, but sometimes I wonder ?? I would like one of those robot vacuum cleaners as I always trip over the cord. Maybe I will give one to myself for Mothers Day. Oh, wow, Regina! What fun he must be having during his retirement, if touring China is just one of the things he retired to do. If my husband’s early retirement includes tours to China>>> I will be going, too! My Hubs, who is a cop, recently went back to dogshift and I am not adjusting well. ugh. I really did laugh out loud when I got to the morning routine. Don’t I know it, I would have all my chores and stuff done by 10, now I don’t leave til 10. KeLLyaNN, when I saw the way you capitalized your Ls and Ns, I was immediately taken back to when my older brother would send me mail. He ALWAYS posted it to “DaNNa”… since all my life people had a difficult time thinking it is Dana. This “late morning” get-up and go time is just not for me! Since I posted about the “late mornings” I have made an effort to pull myself out of bed at 6:30. We’ll see how long this lasts! Congrats on hubby’s retirement. I have several years before I can say those magic words. Enjoy your new lifestyle together! These are early times, so I’m sure a lot of the schedule will equalize over the next few months. My problem, Mary Joy, is that I am still keeping the same nighttime sleeping schedule. If I keep going this way, pretty soon I won’t even be getting out of bed! Haha Danna. I’m sure you’ll work it out. Do you guys ever run errands together? We do – even though he’s not retired. We own our own business, so schedule is very erratic. But lots of times, there is no pressure to do things at a set time. So maybe you’ll just have a more “relaxed” way of handling day to day stuff. Mary Joy, I am sure we will come to some type of more “relaxed” way to spend our days. He is LOVING his retirement! When we bought this house, we bought it for the school district. That meant my husband had to drive 45 minutes to work each way. Granted, he enjoyed his audio books, but he had to keep leaving the house earlier and earlier because the traffic kept getting more congested. He doesn’t miss the commute! Mary Jo. I can hardly stand to go shopping with my darling hubby. He wants to get in and get out. But you let him go shopping, especially for groceries, by himself and he will be gone for as much as 3 hours. For some reason when he goes by himself, he’s talking. He is the same way when I go to the library. He expects me to only be in the library a few minutes. I can’t spend only a few minutes in the library!! I sure do like going someplaces alone.!!! Carol, your early retirement package sounds like it was a great deal. As for actually setting an alarm clock>>> that’s something we won’t be doing. PS>>> I’d get rid of that pesky clock/radio! This reminds me of a friend of mine who is married to a very nice gentleman a few years older than she is. They have no children and are actually well off. One day, from out of the blue, her husband announced that he wanted to take an early retirement. My friend was completely flabbergasted! She came to me one day and told me about her husband’s plan. She said she didn’t want him to retire early. One of the reasons is this, “Can you imagine, I have to feed him lunch everyday?” Of course, I know exactly what she means. Like you, she is used to having all the time to herself during the day. She goes in and out of the house, doing all kinds of errands or whatever it is she wants to do, without time constraints. Another reason is her worry that he would be bothering her all day for “whatever” because he will be bored. He cannot very well clean the house because somebody comes to clean it for them. And the “best” part of why she doesn’t want him to retire early: She will actually be forced to have long conversations with him! Eva, when I read your comment, I was transported to the days when I read Reader’s Digest, and they had a forum with amusing stories readers sent in. I can only imagine how you were able to keep a straight face when she discussed her husband’s early retirement! As for feeding her husband lunch every day>>> Don’t! Mine is on his own for lunch. However, when he worked I fixed him a small cooler each day with his lunch. I can certainly understand about being a whole lot less spontaneous about running errands, etc. Although I suspect that in my case, my husband won’t want to go with me for too much longer. And, of course, since he does his own lunch, I will simply have to get over feeling guilty about not being home when he eats his. It is indeed very hard trying to figure out something for lunch and supper. But my hubby is diabetic so I have to feed him something. Three meals a day can get old in a hurry. Cuts into my reading time! Linda, I know about diabetic cooking. My niece has had Type 1 since she was six. Before that, my sister would make the most beautiful birthday cakes for both of her children. Years ago, there was a woman by the name of JoAnna Lund who wrote many cookbooks with the American Diabetic Association’s food guidelines. I know you use the library a lot, you might want to see if you can check out some of her cookbooks. The one I like best is Healthy Exhanges. It takes time to adjust to retirement. My husband and I both retired less than two years ago, it took me months before I got up later than 7 am. Just before retirement was when I started reading cozy mysteries and found your web site, which opened up a whole world of reading possibilities, greatly enriching my retirement! My hubby retired about 6 years ago. I retired 4 years ago. I sure wish he could find a hobby, but now he often thinks he is sick, but I tend to think he is just bored. I have tried to get him interested in doing other things but he just won’t try anything. I keep telling him that I don’t think he is really sick but just in case he is, I tell him to make an appointment to go see his doctor. But when I say that, for some reason he is instantly better. Me, I like to get up and watch the sun come up. I spent so many years inside a factory building, not being able to see the world come awake that now I don’t want to miss anything. But hubby sleeps late and goes to bed late. He likes to watch those all night TV shows. The only thing is we can not sit in the same room and watch TV because of his love affair with the TV remote. We will be watching something together and zip, that show will suddenly turn into an entirely different show. DRIVES ME NUTS!!! Linda, it sounds like your husband does have a hobby: TV, and channel-surfing! That would drive me nuts, also! His main hobby is in driving me nuts! Linda, I hope he doesn’t read this! Adjustments are difficult. I’ve found that life has changed dramatically for me too since my daughter’s twins arrived. Her one year old daughter and I had a nice little routine during the day which has been altered. My sister complained when my brother-in-law retired that he followed her around, explaining to her how she could vacuum more efficiently! She quickly signed him up for golf lessons and persuaded him to take up gardening. Ann, it’s a good thing for your daughter that she has your help. A one year old daughter AND twins! Yikes! My husband has always been a little like your brother-in-law… always has “helpful” ideas of how I can do things HIS way instead of mine. I have learned to agree about his way, and then do it mine! Sometimes I will ask hubby to help me/or to do some sort of household chore on his own. Whenever he does this then the next time he sees me doing that same chore, even though I have done it on my own for many, many years, that’s not the way he does it!!!!!!!! Linda, you should have bought that t-shirt when you could! Danna, If I ever see that Tee shirt again, I just might buy a few of them. I know I will probably wear one out in a hurry. My parents both got early retirement a number of years ago – but my dad retired a few years before my mom. During that time when she was still working, he was the one responsible for the housework. That made it easier for them to share the responsibility when they both were retired. Of course, they also keep busy with their activities and world traveling! Judith, “world traveling” sounds like a great way to keep yourself busy after retiring early OR late! The first thing my husband did when he retired was to rearrange my kitchen. All of it! And it’s not like he was going to be the one cooking. I still haven’t got it the way I need it! Fortunately (?) he got bit by the antique bug, so he had a hobby. Now the basement, the carport and the garden shed are full of things he can’t bear to sell. But I’m incredibly lucky because there are many things I can’t do anymore, and so he does all the laundry, the dishwasher, and drives me wherever I need to go. I think I’ll keep him! Deb, if I didn’t know it, I would think you are married to my husband! No, he doesn’t collect antiques, do the laundry, or load the dishwashers, but he does have a lot of ways I can improve things I have been doing for years. Deb, My hubby and I had to have another “talk” this week. Now I have been doing dishes since I was 6 years old (I am now 67.) All of a sudden he has a better way. Also we have always had a standing rule that whoever gets out of bed last has to be the one to make the bed. One day this week, hubby got up last but I thought I would help him make the bed anyway. Low and behold, I don’t do it like he does. He had to get another “look.” I also finally had to tell him what was what. Who knows how long that talk will last!!! Linda, I am “proud” to say that my husband “came through” and vacuumed the floor after I dusted this week. I am not supplying any suggestions on how he should do it, though. I know (from past experiences) that if I tell him how to do something, he is apt to tell me that since I can do it better, then I should. Danna, When my hubby tells me of a better way to do things I tell him that just maybe he might try demonstrating his way more often! I really should be ashamed of myself for the hubby bashing that I have done this past week. Yesterday hubby got up early (8:30a.m., for him that is early), took me to a garage sale that had a pancake sausage breakfast. ( My treat) Then to the library, then to the book sale, then grocery shopping. All without complaining!. He was a sweetheart yesterday. Today I am letting him sleep until he decides to wake up. I started reading Sherryl Woods “The Sweet Magnolias” series and I am reading the second book from that series today. I like to read stories of people, especially about women who have had to reinvent their lives for some reason. Two of the best friends in this series have had to deal with cheating spouses. I wonder what it would be like to have the main character of a mystery or the person having to reinvent herself to be the other woman. Might be a nice change of pace to see what certain really good writers could do with a character like this. Can the other women ever exonerate herself, especially if she lives in a small southern city? Has this been done before? Could be a very interesting read!! Linda, great answer to your husband! I’ve never heard of a garage sale that has pancake breakfasts, but it sure is nice that he took you without complaining. Also, thanks for telling us about the Sweet Magnolias series by Sherryl Woods. I have to say that my husband found some satisfying post retirement occupation. He had been a long time Marine reservist in addition to being a school principal. Now through military organizations, he helps counsel returning servicemen. Also now as I am growing more handicapped, he helps with the meals, shops and does laundry. There is never a dull moment around him. By the way he does not read mysteries. My doing so makes him VERY NERVOUS. Regina, your husband sounds like a gem! I’m guessing he has nothing to be nervous about. I loved this column!!! My husband and I have been married for 56 years and he retired early after having a mild stroke and heart attack–he was 62, and had been a policeman, then chief. Our life changed forever, but I was really glad to have him home. I don’t know what a routine is anymore. I always had a place for everything, and everything in its place. Now I hunt for an hour for the remote. We seldom get breakfast over before 10 am, which he cooks. I love every minute we have together–cherish your time together, it goes much too fast. If I want to find the tv remote it is more than likely in my hubby’s pocket. I love my hubby. I really do. I lost one hubby several years ago, so I will, God willing, keep this one around. I have to admit, Linda, it would really annoy me “drive me nuts” if, every time I wanted to use the remote, I had to ask my husband for it. Danna, We sort of have that problem with the remote solved. I fixed an empty bedroom up to be sort of a den with tv, his favorite chair. Hubby can go sit in that room when I give him the “look.” What happens is that hubby doesn’t like certain commercials and when one of these will come on he will change to another channel. Then he will forget” to change the channel back whenever the commercial is over. Sometimes he is watching maybe 3 tv shows at a time. But hey, at least I know where he is. Right now he has a cold. Heaven help wives whose husbands get a cold!! But hey, I do love him. Deanna, how neat that you eat breakfast together. My husband is NOT a morning person, which means we’re on our own for breakfast. It just works out better for us. It’s great hearing about a married-56-year couple who still enjoy each other. Gives us all hope! Deanna, my parents were married almost 62 years when my dad died in 1997. My mother died in 2001. My mom was my dad’s 3rd wife. He always teased her that he couldn’t get rid of her because she started having too many kids too fast. There are 6 of us. But it was just teasing. I always grew up knowing the one thing I wanted out of life was a loving marriage like my parents had. These were hard 62 years but they did love each other. Danna, I really do enjoy all of the postings , replies and comments in this forum of yours but this one has got to be one of my all time favorite. When I was still working a lot of my female coworkers and I would while away a long afternoon by ” Husband bashing.” This was a lot of fun, especially when some of the guys would conteract with some wife bashing of their own.